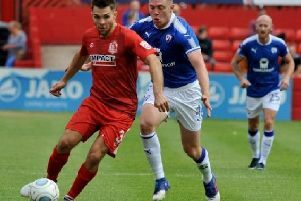 Ian Evatt enjoyed a great end to 2018 with Barrow. Ian Evatt has been named as the Vanarama National League's Manager of the Month for December. Former Spireites defender Evatt, who also had a brief spell in charge as caretaker manager at the Proact Stadium, had enjoyed a mixed start to life with his new club Barrow but form picked up dramatically to close out 2018 in style. It started with a 2-0 win at Braintree Town and was followed up by three points at home to Maidenhead United. They then went to claim victory at Solihull Moors before seeing off Salford City in a thrilling 3-2 win in front of the BT Sport cameras thanks to a goal in the closing seconds of the game. Evatt will bring his Barrow side to the Proact Stadium on Saturday, January 26.